It was Obon time in Japan. The night before we had the most mystic experience of our lives in the Okuno-in cemetery, in the misty mountains of Koyasan. We got up in the temple before 7 o’clock wondering if that memory about giant sequoias, vairocana mantras, thunderstorms and thousands of candles was something that really happened or was just a dream. The strong smell of incense, the warm wood floor and the peace felt in every corner of the temple suggested that we were already part of something big. Laura went to have a shower while I went to the earliest pray ceremony (morning service) in the temple. Barefoot I contemplated the monks doing things that I didn’t understand, putting fire somewhere while singing, kicking a small piece of copper, … I couldn’t hear any other noise or sound than those coming from the monks before 7 o’clock. When the short morning service finished I started walking towards our room when I found Laura in the corridor coming from the shower. It was time for the Goma Fire Ritual. We followed a monk towards some kind of small chapel next to the garden of the temple. All guests from the temple were invited to the ritual, which is unique in Vajrayana and Esoteric Buddhism. It is performed for the benefit of individuals, the state or all sentient beings in general. The consecrated fire is believed to have a powerful cleansing effect spiritually and psychologically. The fire symbolizes the wisdom of the Buddha and the wood sticks symbolize human desires (the root of suffering). The wood sticks are available in the room, and you just need to write your desires on them. Flames can sometimes reach a few meters high. When the Goma Fire Ritual finished we went back to our room to “enjoy” our buddhist vegetarian breakfast. This was the last thing of our experience in Koyasan, the last page of an amazing chapter that we won’t forget. But as always, everything comes to an end and that vegetarian breakfast was the last meal before taking our backpacks and start walking towards the entrance of Koyasan. We went down the mountains with the cable car and then took the train to Nara. From Nara station we started walking east through the Sanjo Dori street. The first thing we saw after few minutes walking was the five storied pagoda in Kofukuji temple. It was originally erected in 730 by Empress Komyo, the daughter of Kofukuji’s founding patron, Fujiwara no Fuhito. It is a national trasure and with a total height of 50.1 meters, it is the second tallest wooden pagoda in Japan. One of the first things you notice in Nara is that it is full of deers. Yes, you have read it well. Not cats, not dogs, but deers. They are calm and usually lying under the shadow of trees. This is shocking and it was even more shocking when we realized that we could touch them like if they were friendly dogs, and feed them with cookies that we bought in one small stand in the street. Walking among tourists, locals and deers we reached the top attraction in Nara: the Todaiji temple. It is the biggest wooden building in the world, it is massive. However, nowadays it is 33% smaller than the original, and had two pagodas next to the main hall with 7 stories and 100m tall each. Incredible. Inside you can find the second biggest buddha in Japan made of copper (90%) and gold (10%). It is a Vairocana Buddha and it is 16 metres tall flanked by two Bodhisattvas. Each eye is as big as 1 metre! Behind the Buddha there is a huge column made of wood with a hole in its base. It is said that those than can go through the hole will get the enlightenment. Unfortunately the hole is so narrow that only children were able to do so… Would you try anyway? After Todaiji we relaxed in a typical japanese garden which fee was free! And it was a perfect retreat in a so hot day. We highly recommend the Yoshiki-en garden. It is difficult to find because the entrance is hidden in a narrow street. But when you get in, a wide green space opens in front of you. It has a lake, a tea house, typical stone bridges and there are no tourists. At least this is what we saw. After some minutes lying in the shadow we were recovered of our tiredness. Then we lead towards our last visit in Nara: the Shinto temple called Kasuga-taisha, which is a World Heritage site. One of the most beautiful sceneries in Nara is found in the paths towards this temple through the Nara Park. Every path is flanked with hundreds of stone candles which are only fired for Obon. We ended the day in Osaka having dinner in Dotonbori, the craziest street in all Kanzai, but this was already explained in another post. We started the day in the quietest and most peaceful place in Japan and we ended it surrounded by skyscrapers, lights and people. Without any doubt, Japan is a country of contrasts. How cute! I’ve never heard of this town and it’s deer! It’s a little strange though how relaxed they are in the presence of so many people! Never seen anyone pet a deer before! 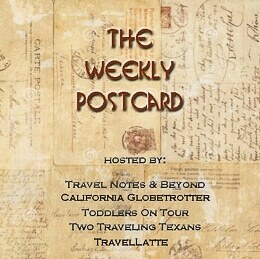 Thanks for much for sharing on #TheWeeklyPostcard!